Usain Bolt destroyed a worth class field to set a new world record as he exploded to victory in the 100m at the World Championships in Berlin. The triple Olympic Gold medalist took control of the race from 30 metres in to record a time of 9.58 seconds to remove 0.11 off the record he set last year when winning gold at the Beijing Olympics. American Tyson Gay was second in a time sn American record time of 9.71, with Jamaica’s Asafa Powell claiming bronze in 9.84, his fastest time of 2009. 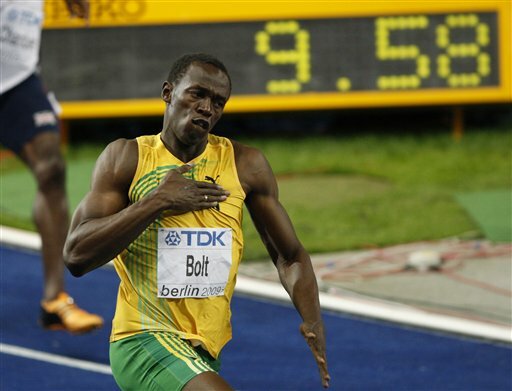 World record Olympic Gold for Usain Bolt!